IKEA Backabro armchairs maybe are not this top and flague model of the furniture, yet, it is very classy and stylish. If it is nowadays too plain for you and you would like to change your armchair a little bit, we are here to help you. Here in Soferia you can order replacement slipcovers for any IKEA Backabro armchair you own in your house. 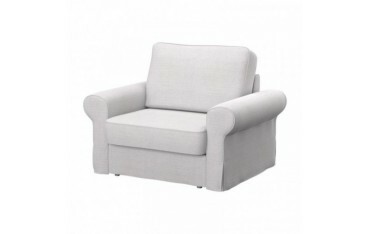 With just a simple replacement slipcover you will give your old IKEA Backabro armchair a brand new life. The fact which is really important is, that most of our replacement slipcovers for all the IKEA furniture are hydrophobic, which means, they do not sink with water and any different liquids, and furthermore, they are, indeed, very easy to clean. If you are a customer with very high requirements and you are not sure yet, which model of the fabric you would like to order when it comes to texture and colour, you can order samples of fabrics before. They will be sent directly to your home to make you sure about knowing all the characteristics of the material.